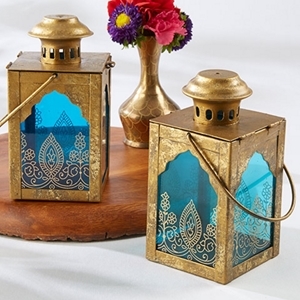 A lantern with a unique design inspired by Indian wedding aesthetics, this lantern is decorated with Indian themed motifs. Measuring 3 X 8.46 inches with the lid on, and 3 X 3 X 6.49 inches with the lid off. It comes in an antique gold finish adorned with blue glass featuring henna designs in matte gold. 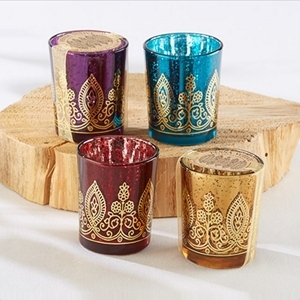 "Silvered" glasses with a gold metallic henna design, these tealight candleholders come packaged with a gold organza ribbon and a kraft tag. The Votives are 2.5 inches tall and 2 inches wide, and come in a set of 4 assorted jewel toned colors, with the colors being sapphire, amethyst, ruby, and citrine. The perfect decoration when it comes to the lighting department, this aluminium lantern measuring 4.52 inches without handle and 6.69 inches with it is your best bet. 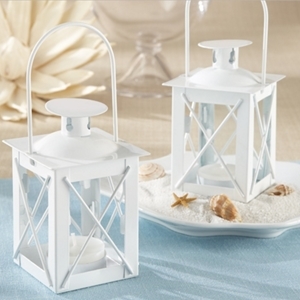 The lantern comes with a removable lid in white. 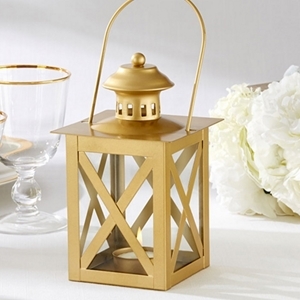 This is a lantern that’s sure to impress with its golden finish and vintage design. Measuring 3.18 X 3.18 X 9.05 inches with lid, and 3.18 X 3.18 X 7.08 inches without it. The lantern is available is available in a perennially appealing matte gold finish. 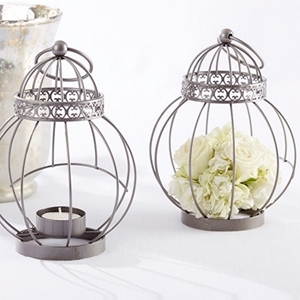 With its captivating design, this lantern finished in antique silver and featuring a circular birdcage shape is sure to the center of attention at your ceremony. The lantern measures 5.3 X 5.1 X 7.08 inches without the handle, while measuring 5.3 X 5.1 X 8.66 inches with it. An original lighting source, the Soft Light Champagne Glass Lantern is a light frosted champagne mercury glass with an attached silver metal chain. This is a clever decorative accessory in the at a a special wedding ceremony. The lantern measures 3.9 X 3.9 X 3.1 inches, with the height extending up to 6.9 inches when the chain is tensed. 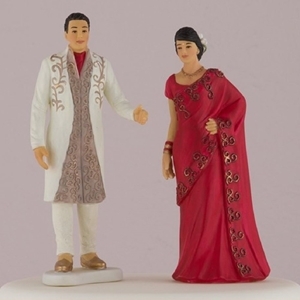 These porcelain figurines are hand painted with traditional Indian clothes. Set includes both, the bride and the groom. The bride measures 2 (W) x 1 1/2 (D) x 5 1/8 (H). Groom measures 2 1/8 (W) x 1 7/8 (D) x 5 1/2 (H). 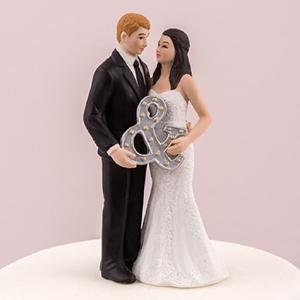 The perfect item to top off a wedding cake, this cake topper are sure to make attendees smile. 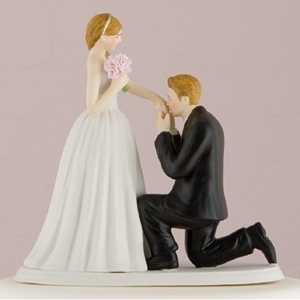 The bride and groom figurines are made of porcelain and they are hand sculpted and painted. The figurines measure 2.25 X 2.125 X 5 inches. A wedding is one of the most special occasions an individual goes through in life, which is it needs to be commemorated in an equally special manner. Good aesthetics can go a long way in achieving said effect, and quality wedding décor, especially quality wedding ornaments, are an absolute must have as a result. Wedding ornaments can be anything within the range of the imagination, but the one common thread running through all of them is that their primary purpose is to beautify whichever aspect of the wedding ceremony they are thrust into. What Makes a Great a Wedding Ornament? Wedding ornaments are expected to consistently provide an aesthetic enhancement to the wedding venue that is in tune with the ceremony’s theme. Candle holders, for example, along with decorative candles, can play a role in setting a romantic mood in a candlelit dining room. These items have the unique quality of lifting up the atmosphere of any surrounding they’re in, and weddings are the most relevant example of this. 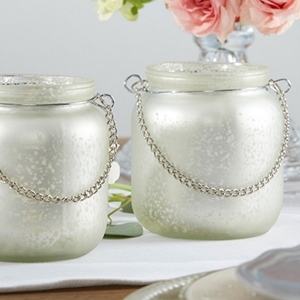 This is why wedding candle holders feature ornate designs to gel with the wedding’s aesthetic. The same extends to lanterns, which can be thought of as a cousin to candleholders when it comes to lighting based wedding ornaments. However, owing to their inherent nature, lanterns allow for a greater aesthetic flexibility. Their design can range from very minimalistic, to extremely intricate; this range ensures there’s a style for every wedding. Among other popular ornaments, there are wedding centerpieces, which can be thought of as fillers that take care of the unsightly empty spaces at reception tables. There are many types as well, with the most common ones including beautiful vases filled with flowers to add a scent of love in the air. Other common centerpieces can be figurines and statuettes that complement the visual theme prevalent at your wedding ceremony. And while on the subject of figurines, cake toppers are perhaps the most sought after wedding ornaments of them all. Cake toppers include a set of mini figures representing the honored couple that go on top of the cake. They can either be made out of porcelain, wood or any other material, and their selection can either be generic or customized to resemble the couple getting married. These are some of the more specific wedding ornaments sought after for a wedding, but even apart from the aforementioned, there are countless other wedding ornaments that will unquestionably beautify the wedding venue. CeremonialSupplies.com maintains a vast collection of wedding ornaments to make your reception one that will never be forgotten. All wedding ornaments are carefully selected per the strictest guidelines to ensure the items being sold to you are as durable and high quality as they are attractive. Choose us for the most reliable and hassle free buying experience when shopping for wedding decorations and ceremonial supplies. Contact our toll-free number at 1877-373-4273 or e-mail sales@ceremonialsupplies.com to inquire about our ornamental wedding products.